Following his final game against England 'RH' was approached by the Big 5 to see if he was available for the Scotland match but he was not as he was due to marry my mum so in fact his last game of rugby was the English match……….he never played or wanted to play again. When the Scots game was being played dad and Terry Davies the great full back were building a shed in my dad’s garden!!!! What’s amazing is that he was 29 when he retired. There is no new thing under the sun, according to the Good Book. As controversy rages worldwide over prospective law changes to the set-piece in rugby's good book, particularly the legislation relating to the scrum, it is true to say that feelings ran just as high fifty years ago, when radical alterations to the rules governing the line-out were first introduced. The result of the changes in 1954 was to nullify the effective technique of Neath's salmon-leaping line-out ace, Roy John, whose modus operandi depended for its success on the patterned blocking of his props and second-row partners. When the International Rugby Board outlawed this so-called wedge method, a new breed of line-out expert who could hold his own in the absence of minders was sought. Step forward Rhys Haydn Williams - or "R H" as he was always affectionately known. Williams was the player who admirably filled the part for Wales between 1954 and 1960. A beefy forward from Cwmllynfell, who graduated with a science degree from Cardiff University , R H brought the systematic, intellectual approach of the research chemist to his tight-forward work. At the height of his career for Wales and the Lions, he was the master of all the forward arts: line-out catching, scrummaging and mauling, and even the ancient skill of dribbling. He was the real pack professor in Welsh rugby and, at a time when the line-out had a tendency to develop into a standing maul, his middle-of-the-line strength was priceless. It was said of him that when he hit a ruck or maul it moved - visibly. Wales prospered after R H entered their side midway through the 1954 Five Nations campaign. He replaced Roy John and helped them to wins against Ireland , France and Scotland , and Wales finished the season joint champions with France and England . "Rhys Williams added vigour to the Welsh eight," noted one correspondent after the new lock had made his debut against Ireland in a match won through a last-minute dropped goal by his former Ystalyfera school chum and Llanelli club colleague, Denzil Thomas. By the end of the season, R H was being hailed as the find of the year in Wales . A newspaper pen-picture of him on the morning of the Scotland match at St Helen's in April stated: "Williams is one of the best of the younger school, expert in the loose and line-out play, and has helped improve Welsh scrummaging." His versatility about the field that day confused the editor of the Playfair Rugby Annual. Admittedly there were four Williamses in the side that defeated Scotland in Swansea's last-ever Five Nations match, and two of them - Ray (a wing from Llanelli) and Billy (the Swansea prop) scored tries. But Owen L Owen in his summary of the game for the Annual somehow managed to attribute the first Welsh try to big R H. The player cleared matters up years later, emphasising with typical modesty that he had never managed to score a try for Wales in his 23 international appearances. He was at the heart of his country's efforts again in 1955, another championship-sharing season, and his line-out prowess for the Lions in South Africa that year was a vital ingredient of the tourists' winning recipe in the third Test in Pretoria - that city's first-ever international match. Through his expertise, the Lions won the decisive line-outs by a ratio of 2:1, giving Dickie Jeeps and Cliff Morgan, the halves, sufficient ball for them to exercise a tight tactical grip on the Test. Vivian Jenkins, in his cable to the Sunday Times in London, wrote: "The British [and Irish] forwards now began to warm to their work and were holding their own both in the scrums and line-outs with [Tom] Reid and Rhys Williams continually prominent. They were the giants of the piece. They took on the mammoth second-row men . . . at their own game, pushing like heroes and rising - literally - to heights previously unattained on tour." Reid and Williams were at their fittest on that tour, though comparisons with the modern training regimes Lions parties follow when preparing for tours makes interesting reading. Big R H "trained" with bricks (as improvised dumb-bells) when the Lions assembled at Eastbourne before leaving for the Cape . In 1956, a fresh challenge to Welsh supremacy was launched by a new-look England pack that included the young second-row pairing of Oxbridge and Harlequins giants, John Currie and David Marques. R H, showing no signs of fatigue after the long tour of South Africa, stoked the engine-room of a Welsh pack that, despite struggling to hold its own against the coltish exuberance of the English, managed to set up a narrow 8-3 victory at Twickenham and went on to win the Five Nations title outright. Several barren seasons followed for Wales , but there were plenty of rugby honours still to be collected by R H. He captained his club, Llanelli, and took them behind the Iron Curtain to play a trail-blazing game in Moscow . He was greeted as a "blood-brother" by the magnificent New Zealand pack against whom he toiled in 1959 on his second Lions tour. The tourists played their best rugby in the final Test at Auckland to win 9-6, but it was thanks to the Welshman's all-round strength that they held their lead in the closing stages of the match. Vivian Jenkins put R H's contribution to that victory sharply into perspective in his tour book, Lions Down Under. "One should have added," Jenkins wrote, "that Rhys Williams played a vital part at a critical period in the second half by winning six line-outs in a row." The All Blacks rated Williams good enough to play for New Zealand and paid him the great compliment of inviting him to their farewell party for his famous second-row opponent, "Tiny" Hill, who retired at the end of the series. The New Zealand Rugby Almanac for 1960 named R H as one of its five Players of the Year, the citation calling him "the outstanding forward of the Lions side. He had as much energy at the end of the tour after 17 appearances as he did at the start." After ten successive Lions Test appearances between 1955 and 1959 - a then record - he came home from New Zealand and was named captain of Wales for the start of the 1960 Five Nations Championship. Wales, with a host of returning Lions, were expected to defeat an inexperienced England side at Twickenham. But sadly R H, the fair-haired colossus who always played fair, found his side 0-14 down at half-time. He rallied his charges in the second-half, but Wales could only manage two Terry Davies penalties before finally going down 6-14 - a whipping compared to the low-scoring norms of the day. R H was dropped and retired at the end of the season. R H had made his Llanelli debut as a teenaged student in 1949-50. 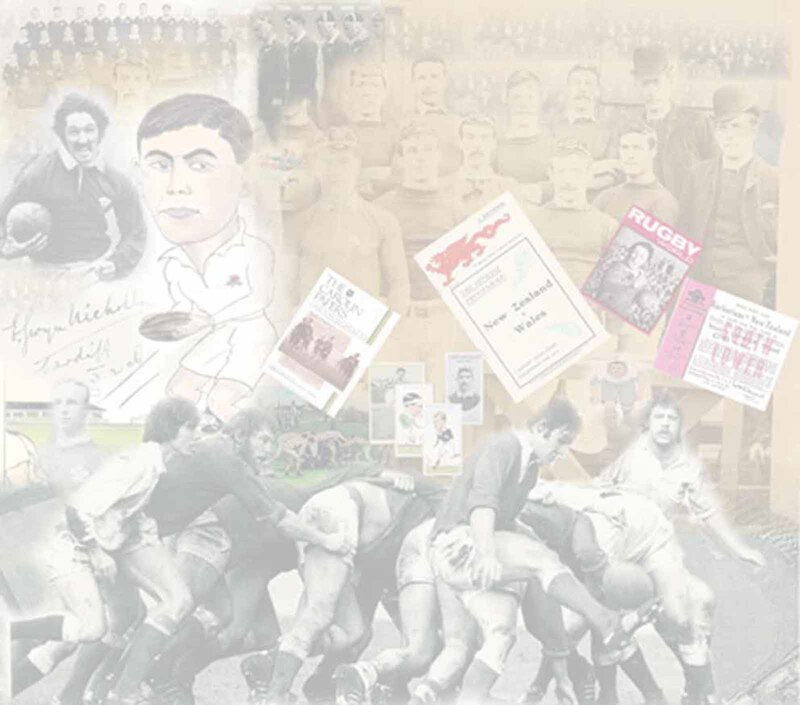 Playing for Cardiff University against Pontyberem, he had impressed the former Llanelli and Wales forward Ossie Williams, who encouraged him to join the Scarlets. R H, a proud Welshman and a proud Welsh-speaker, never looked back and relished the company of a side that was predominantly Welsh-speaking. In later years he disclosed that the achievement that gave him the greatest satisfaction as a Scarlet was leading the club to four victories over Swansea during his season as captain in 1957-58 - west Walians who recall the epic matches between these great rivals in the pre-Welsh Region days will know exactly what he meant. Apart from his beloved Scarlets, he also had a soft spot for South African rugby and many of the landmarks in his notable playing career were to involve the Springboks. His first taste of the big time came in the autumn of 1951 when he turned out for his club against Basil Kenyon's tourists. Llanelli were beaten 11-20 but J B G Thomas, in the Western Mail, had noted the young second-row's promise. "In the Llanelly pack," he wrote, "R H Williams was always going well." On the strength of his performance against the tourists he was invited to play for the Whites (the junior side) in the first Welsh Trial, but he couldn't oust Roy John, the established Welsh line-out jumper, from the side that was subsequently chosen to represent Wales against South Africa in December in a match billed as for the Championship of the World. R H meanwhile had entered the RAF on National Service as an education officer after graduating from Cardiff University and it was for the Combined Services team that he again tasted representative rugby playing against the South Africans on Boxing Day at Twickenham. Further highlights of his career involved the 1955 Lions trip there, when his reputation was confirmed, and a return visit with the Barbarians in the summer of 1958. He also toured Canada with the famous club in 1957 and later served as a Barbarians committee member and selector. For many years he was a production superintendent with the Steel Company of Wales , but despite his strong west Walian roots he moved to Cardiff in the early 1970s, returning to the education sphere to work as an officer at County Hall. He later became assistant director of education for Mid Glamorgan before taking early retirement and spending part of his leisure time in the company of old rugby pals at Cardiff Athletic Club, regaling them with an unending stream of rugby stories told with humour and wit. He also put a lot back into the game he loved, serving the Welsh Rugby Union as an administrator for more than a dozen years. After cutting his committee teeth at Llanelli and then with junior clubs in Cardiff, he joined the WRU advisory coaching committee before being approached to stand as a national representative in 1975 when his former Wales second-row partner, Rees Stephens, stood down through ill health. A strong candidate, R H became a selector, managed the Wales B team that visited Spain in 1983 and later succeeded Keith Rowlands as chairman of the WRU's Big Five. But in 1989 he resigned amid bitter controversy. He had been invited to take part in the centenary celebrations of the South African Rugby Board, but after saying originally that he would not be going he accepted his invitation. As the junior vice-president of the Union he was due to act as president in 1991, but his resignation in the aftermath of his visit deprived him of that final honour. He died, aged 62, in January 1993 and was widely mourned. Numerous Lions of the 1950s vintages turned out to pay their final respects to the man whose deeds in the engine-room of the pack enabled others to shine. Lions career: Toured South Africa with the 1955 side. 15 matches (including all four Test). Toured Australia and New Zealand with the 1959 side; 21 matches including all six Tests (two in Australia and four in New Zealand ).